Blackpool's tough start to life in League One continued as Burton came from a goal down to win at Bloomfield Road. The hosts, who have failed to win any of their opening four matches this season, led at the break thanks to Jack Redshaw's strike. Abdenasser El Khayati cut in from the left and hit a low shot in the corner to level just before the hour mark. The Dutchman then won it with a 20-yard free-kick that went in off the bar. Match ends, Blackpool 1, Burton Albion 2. Second Half ends, Blackpool 1, Burton Albion 2. Corner, Burton Albion. Conceded by David Ferguson. David Ferguson (Blackpool) wins a free kick on the right wing. Foul by Abdenasser El Khayati (Burton Albion). Lloyd Jones (Blackpool) wins a free kick in the attacking half. Foul by Aurélien Joachim (Burton Albion). Substitution, Burton Albion. Anthony O'Connor replaces Stuart Beavon. Foul by Kwame Thomas (Blackpool). John Mousinho (Burton Albion) wins a free kick in the attacking half. Substitution, Blackpool. Kwame Thomas replaces Jack Redshaw. Henry Cameron (Blackpool) wins a free kick in the defensive half. Goal! Blackpool 1, Burton Albion 2. 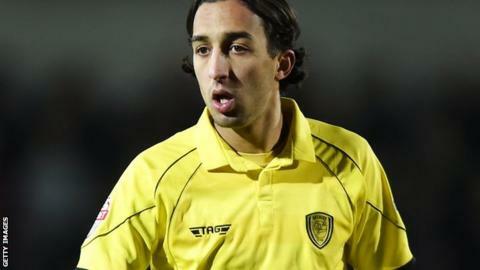 Abdenasser El Khayati (Burton Albion) from a free kick with a right footed shot to the top right corner. Foul by Charles Dunne (Blackpool). Stuart Beavon (Burton Albion) wins a free kick in the defensive half. Corner, Blackpool. Conceded by Jon McLaughlin. Attempt saved. Charles Dunne (Blackpool) left footed shot from a difficult angle on the left is saved in the bottom left corner. Emmerson Boyce (Blackpool) wins a free kick in the attacking half. Attempt saved. Stuart Beavon (Burton Albion) right footed shot from the centre of the box is saved in the bottom right corner. Attempt missed. Mark Cullen (Blackpool) right footed shot from the right side of the box is high and wide to the right. Substitution, Burton Albion. Tom Naylor replaces Callum Butcher. Attempt saved. Jack Redshaw (Blackpool) right footed shot from the left side of the box is saved in the top centre of the goal. Corner, Blackpool. Conceded by Abdenasser El Khayati. Attempt missed. Stuart Beavon (Burton Albion) right footed shot from outside the box is close, but misses to the left. Attempt missed. Damien McCrory (Burton Albion) right footed shot from long range on the left is close, but misses to the right. Corner, Burton Albion. Conceded by Emmerson Boyce. Foul by Mark Cullen (Blackpool). Robbie Weir (Burton Albion) wins a free kick on the left wing. Hand ball by Philip Edwards (Burton Albion). Substitution, Burton Albion. Aurélien Joachim replaces Timmy Thiele. Attempt blocked. Callum Butcher (Burton Albion) right footed shot from outside the box is blocked. Attempt saved. Timmy Thiele (Burton Albion) right footed shot from outside the box is saved in the bottom left corner. Connor Oliver (Blackpool) wins a free kick in the attacking half. Foul by Stuart Beavon (Burton Albion). Attempt missed. Mark Duffy (Burton Albion) right footed shot from outside the box is too high. Attempt missed. Timmy Thiele (Burton Albion) right footed shot from outside the box is too high. Substitution, Blackpool. Connor Oliver replaces Jim McAlister. Substitution, Blackpool. Charles Dunne replaces Bright Samuel.